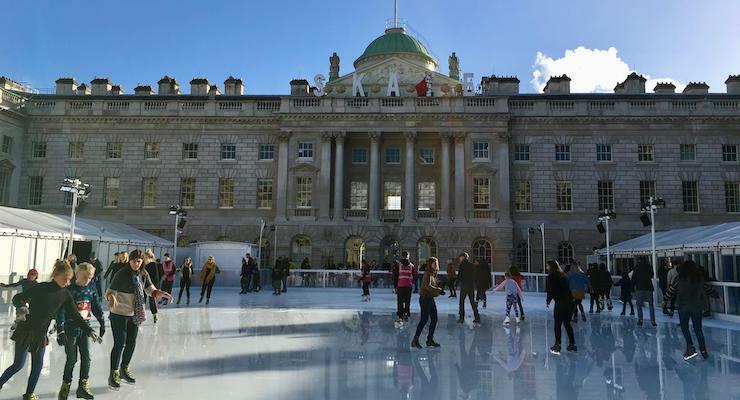 Last year we went ice skating at Somerset House for the first time, and I have to say that I think that it’s my favourite place to skate in London. So when I was invited to an afternoon preview event there this winter, I was very happy to accept. Set in the vast enclosed Edmond J. Safra Fountain courtyard of the palatial Georgian building, the rink is a joy to skate on. As you enter the courtyard from the Strand, there’s a beautiful 40-foot high Fortnum and Mason Christmas tree standing sentinel next to the rink. At the opposite end of the courtyard, a separate training area of the rink for children contains polar bear skate mates to help smaller skaters to find their balance on the ice. To the left of the rink is the Skate Lounge cafe and bar area. We’re instructed to leave our bags in the cloakroom before swapping our winter boots for ice skates. The skates are brand new and feel comfortable. Laced up, we step onto the ice and push off gingerly, neither of us having skated since last winter. There’s just a handful of skaters on the ice, with some pink-jacketed marshalls to keep an eye on things. My sister finds her feet quicker than I do, and is off and lapping me in no time, occasionally slowing down to keep me company as I pootle along. There’s upbeat music playing from loudspeakers around the rink, the sky is blue, the air cool. As I gradually speed up, I feel exhilarated. We skate for an hour, by the end of which we’re keeping pace with each other, chatting as we go. We manage not to fall over. When our legs start to ache, we decide that it’s time for a snack and a drink. We swap skates for boots, retrieve our bags and head to the Skate Lounge. The Skate Lounge is warm and cosy with sofas and low tables on one side and high tables and stools on the other. We find a table and a pair of stools to perch on overlooking the rink, and we refuel with mince pies and marshmallow-topped hot chocolate. 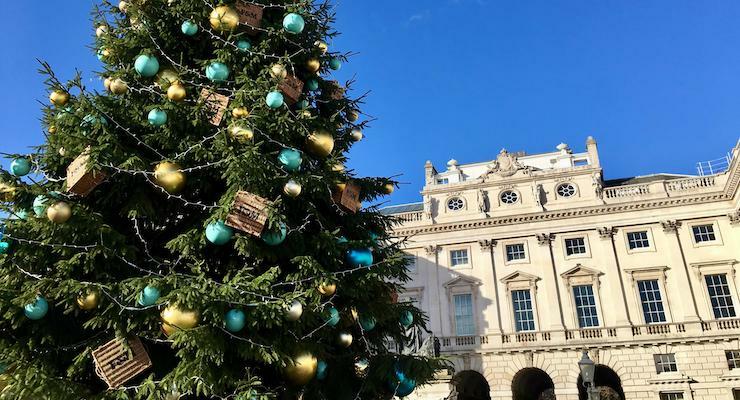 From the Skate Lounge we stroll across to the West Wing of Somerset House to look at the splendidly festive Fortnum and Mason’s Christmas Arcade. A series of rooms off a central corridor house beautiful and luxurious things for you to buy. From hampers and speciality teas to cashmere gloves and handmade decorations, there’s a wide range of gorgeous gifts to choose from – but it’s definitely not a place for bargain-hunters. There’s also a restaurant in the arcade, Fortnum’s Lodge. Formerly home to various government departments, Somerset House is now a thriving arts centre and home to a range of permanent and temporary exhibitions. After ice skating we are invited to see the current major exhibition, Good Grief Charlie Brown!, which is a celebration of the work of Peanuts creator Charles M. Schultz. As a child I enjoyed reading the Peanuts comic strips in my dad’s newspaper, but I had no idea of the characters’ cultural significance and enduring influence. I’ve now learnt that Lucy and Peppermint Patty were feminist icons, that there was an actual Snoopy for President campaign in the US in the 1970s (now there’s a campaign which is ripe for revival), and that NASA has a Silver Snoopy flight safety award. I found the exhibition fascinating, and would definitely recommend it. 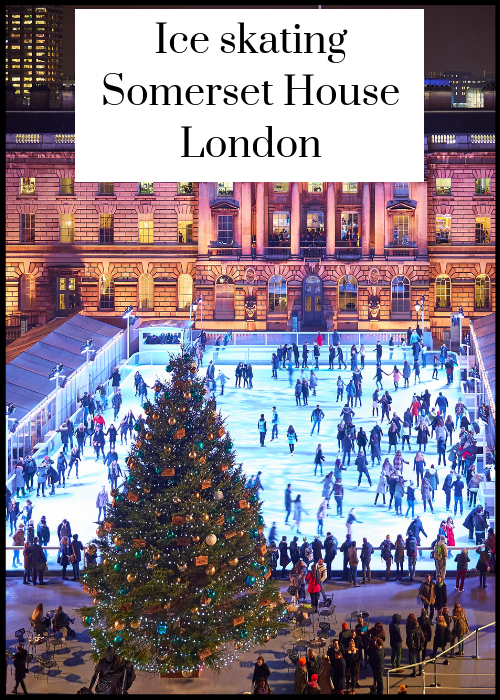 Ice skating at Somerset House costs from £11 for adults, £8.50 for children, including skate hire. It’s best to book sessions in advance, as they do sell out. The ice rink is open until January 13th, 2019. Tickets for Good Grief, Charlie Brown! cost £14.00, under-12s are free . The exhibition is running until March 3rd, 2019. Each month I publish a round-up of great things to do in London – you can find the December version here. If you’d like a London guide book, I recommend both the Lonely Planet London Travel Guide and the London Marco Polo Travel Guide. If you need accommodation, check out my post about family-friendly places to stay in the capital. Disclosure: We were invited to skate at Somerset House and to the Peanuts exhibition at a press preview event. This post contains some affiliate links, which means that if you clicked through and booked I may receive a small commission. All opinions, images, words and slow skating skills are my own, as ever. Somerset House is so well positioned, isn’t it? I love the Fortnums Christmas hall. Thos whole place just feels so festive at this time of year – we really enjoyed our trip there.